Maybe it's the approach of the soccer World Cup, that's bringing soccer fever to schoolyards...it's up to you to choose your favorite team - and your favorite team strip! Loïc had another idea : create his own soccer strip with its own design! 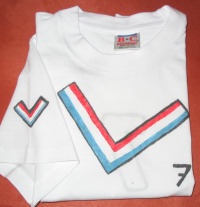 + If you're not happy with the design, rinse the t-shirt in water and the paint disappears. + After ironing, the strip washes perfectly at 86 fahrenheit and can be tumble dried too. - It's not easy for the kids to get an even flow from the bottle ! - Hand washing is recommanded, even though it's less practical for moms! With a drawing pencil, draw the designs to be painted, on the t-shirt. It's highly recommended to try the designs out on a piece of paper beforehand ! Place the t-shirt in a carton to protect the other side from getting paint on it. Use stencils (taken from the toy box - letters or numbers in wood, flat shapes etc) for any curves. As soon as the back is dry to the touch, personalize by placing your favorite number, or even your given name (but not your surname) on the shirt. Leave to dry flat for 24 hours (even 72 hours for certain bits) That next soccer match will just have to wait a bit longer! The colors are normally fixed by ironing, sometimes in the oven or the dryer - read the instructions on the paint. Iron from the inside of the shirt. The crucial detail : repeat the logo on the sleeve! If it's cycling that interests you most, then it's a cyclist's strip that's to be personalized !